If you fish from a boat, there is a good chance you will have been interviewed by someone from NIWA in recent years, but why do we do this and how is your information used? Recreational fishing is more popular than ever, and there is a growing need to monitor the catch of recreational, customary and commercial fishers if we want plenty of fish to catch in the future. Interviews with recreational fishers also give us unique insights into how healthy inshore fish populations are, as well as valuable information on whether catch rates (abundance) are increasing or decreasing over time, and whether fish are living long enough to spawn in sufficient numbers. Managing coastal fisheries is especially challenging, because we need to monitor the catches made by the recreational, customary and commercial sectors in order to sustainably maintain fish stocks in the future. Commercial fishers are required to report the weight of their landed catch, but how much is taken by the recreational sector? 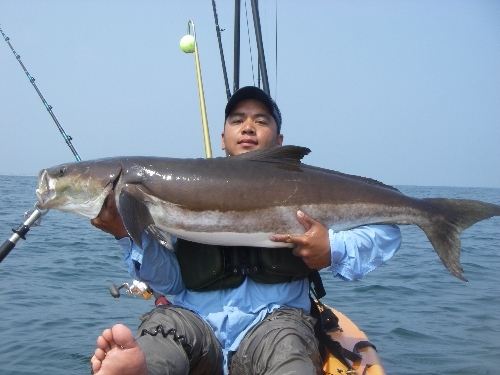 Recreational fishing is just that – recreational. Most fishers only go fishing a few times a year and have little motivation to report their activity to others if their catch isn’t spectacular. The chances of everyone voluntarily and reliably reporting all of the catch taken over every fishing trip would be extremely low. The solution used in New Zealand – and around the world – involves conducting structured surveys that are designed to provide representative snapshots of a fishery so we can scale up the catch we observe to account for the catch we don’t. NIWA uses a combination of boat-ramp surveys (this is where you are likely to encounter Niwa interviewers), counts of boats from the air, and cameras that count trailer boats returning to boat ramps, to achieve this. These surveys are funded by the Ministry for Primary Industries (MPI). Another company, the National Research Bureau (NRB), has developed another survey method called a National Panel Survey, which does not rely on interviews with fishers at boat ramps, to give us an independent second look at the estimates generated by our surveys. When we compared catch estimates produced by a NIWA survey of the recreational fishery off northeastern New Zealand in 2011–2012 with those produced by a concurrent NRB survey, the results are remarkably similar. The estimates produced by these surveys were further corroborated by a third smaller-scale boat-ramp survey of the eastern Coromandel fishery undertaken by Blue Water Marine Research. These comparisons give us some confidence in the reliability of our methods. All three surveys were reviewed by experts from overseas, who concluded they were very well designed and best practice. Large-scale surveys designed to estimate harvests taken from fish populations are very expensive, however, and we can only do them every five to six years, so we need another cost-effective method to monitor trends in the meantime. NIWA uses boat-ramp cameras to continuously monitor long-term trends in traffic at popular ramps, as well as frequent interviews with fishers to tell us the proportion of vessels used to go fishing, and what the average catch of each species was per boat. We have done this since 2011 and been surprised by how much the catch landed at surveyed ramps within a region has changed over time. Most of this is due to changes in catch rates rather than changes in the number of boats that go fishing. Once again, the information you provide during boat-ramp interviews underpins this monitoring programme. How many fish are in the sea? It’s as simple as counting trees – except that fish move and you can’t see them to count them in the first place! Understanding who is taking how much is a good start, but is that too much? Can we safely take more? Some species such as kahawai are very resilient, as they become reproductively active when about four years old and quickly put on body mass. Other species, such as snapper, grow much more slowly and can take twice as long to reach reproductive age. One way of understanding how productive a fish population can be involves determining how abundance changes in response to fishing pressure. When we count your catch and find out how long you were fishing for, we use this information to track changes in catch rates over time – a commonly used measure of fish abundance (and fisher satisfaction). We also ask if we can measure your catch during an interview, and these measurements are used to monitor changes in the size of fish caught by recreational fishers. This provides another window into the state of our fishery, which we use to determine whether enough fish are reaching reproductive maturity. During most summers since 2001, we have also been asking fishers on the northeastern coast of the North Island if we can cut the heads off any kahawai landed. 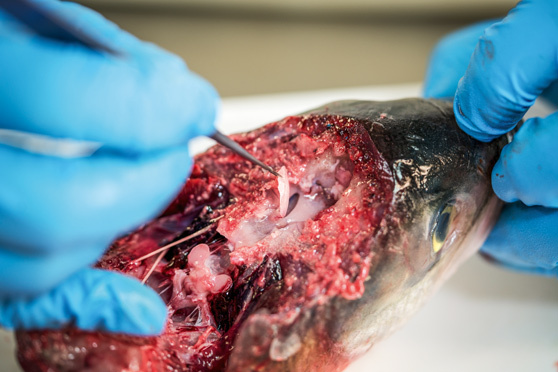 We do this so we can later remove the otoliths (‘ear bones’) from the heads in a lab. Thin sections through the core of these otoliths are taken to reveal annual growth rings similar to those seen in trees. We have used these otolith readings to monitor changes in age composition of the northeastern kahawai stock over time. For example, if we see strong pulses of young fish entering into a population, that tells us there has been good recruitment, which the fishery will benefit from in the future. Alternatively, if we see that older fish within the population are disappearing faster than the rate of younger fish coming into the population, that suggests that fishing pressure may be too high. How is all this information used to set catch limits? We also incorporate other sources of information into our population models, such as fishery surveys and commercial catch-rate data. These models are broadly similar to those developed by insurance actuaries to determine risk when setting your life-insurance premium. We use these models to understand the abundance of fish within a population compared to management targets set by MPI. These models can also be used to predict what will happen to a fish population under different management regimes. The best example of your data informing a fish-population assessment is for the KAH 1 stock (the kahawai population off northeastern New Zealand). Almost all the data used to monitor, model and manage this population comes from interviews with fishers returning to boat ramps. The current catch limits for this population have been largely based on this population assessment, and fishers in the Hauraki Gulf will have noticed the resulting population recovery. These models, however, are only as good as the data that goes into them. So think of the couple of minutes you spend answering our questions as an insurance policy that you take out to ensure good fishing in the future for yourself and your kids. We cannot emphasise enough how grateful we are for the continued cooperation by recreational fishers who participate in our surveys, because we need as much information as possible from as many sources as we can to successfully manage inshore fish populations.